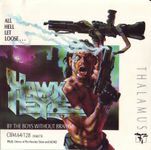 Hawkeye is the fifth game from Thalamus for the Commodore 64, and is a run-and-gun platform game designed and programmed by the Dutch team Boys without Brains. The player is to run back and forth on the stage, collecting power-up items, jumping and shooting enemies, until the "leave the stage" item shows up, at which point the player can leave the stage through the rightmost wall. Side trivia: The 1990 game "Flimbo's Quest" for Commodore 64 was rumoured to run on Hawkeye's code but with altered graphics. Flimbo's Quest creator Laurens van der Donk and Hawkeye creators The Boys Without Brains both being Dutch, and the music being created by the same Dutch group of musicians, enforced this, and the games are essentially identical in gameplay, with Hawkeye having an oily cyborg male as protagonist and Flimbo's Quest having a cartoon boy.